The FAO Food Price Index shows that high food prices have been around for the past few years. The FAO, in its recent Cereal Supply and Demand Brief, explains that we can expect prices to rise, as illustrated below. The Economic Research Service of the U.S. Department of Agriculture mentions, in its Food Price Outlook, 2012-2013, that the "drought has affected prices for corn and soybeans as well as other field crops which should, in turn, drive up retail food prices". How can we avoid that such a scenario will eventuate? Obviously, once we are in the fourth development, i.e. mass-scale famine and extintion, it will be too late for action. Similarly, if the world moves into the third development, i.e. runaway global warming, it will be hard, if not impossible to reverse such a development. Even if we act now, it will be hard to reverse the second development, i.e. 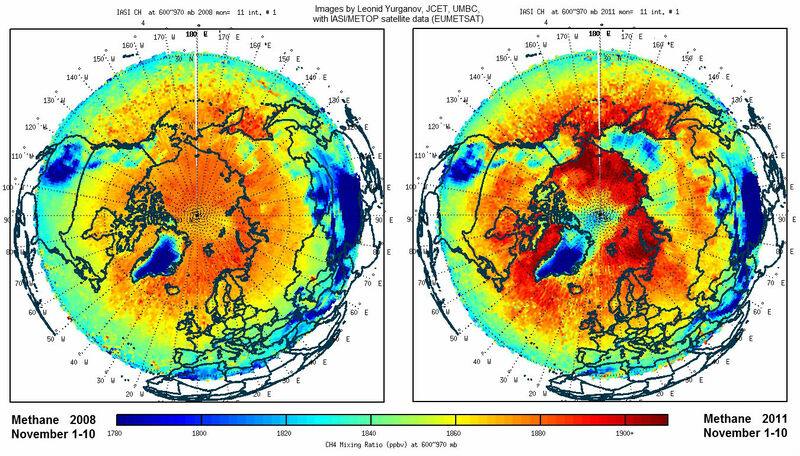 accelerated warming in the Arctic. The most effective action will target causes rather than symptoms of these developments. Part 2. Solar radiation management is needed to cool the Arctic. As indicated at the bottom of the image, the most effective policies to accomplish the goals set out in both part 1. and part 3. are feebates, preferably implemented locally. 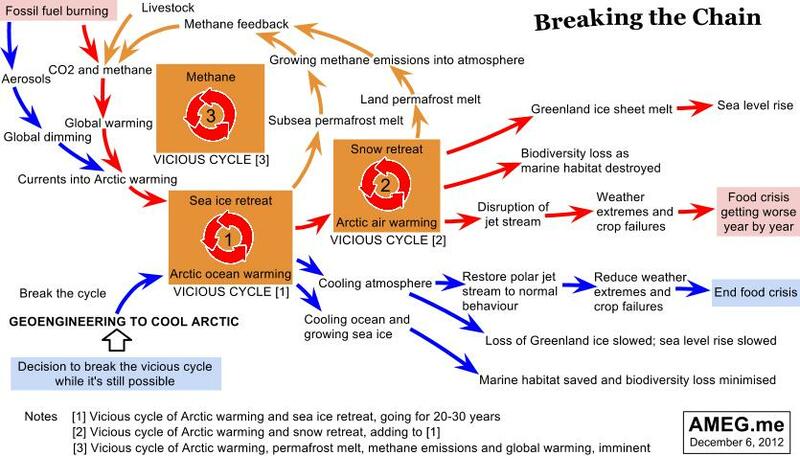 The image below was posted earlier at Methane contributes to accelerated warming in the Arctic. As mentioned there, this is a compilation of images produced by Dr. Leonid Yurganov, comparing methane levels between November 21-30, 2008 (below left), and November 21-30, 2012 (below right). Dr. Yurganov has released two further images this year, i.e. for December 1-10, 2012 (below left), and for December 11-20, 2012 (below right). The images show that the highest methane levels show up above the water, as opposed to above land, indicating that methane is being released from the seabed across the Arctic. The images further show that high levels of methane persist in December 2012. Apart from comparing 10-day periods, we can also look at methane levels for individual days. 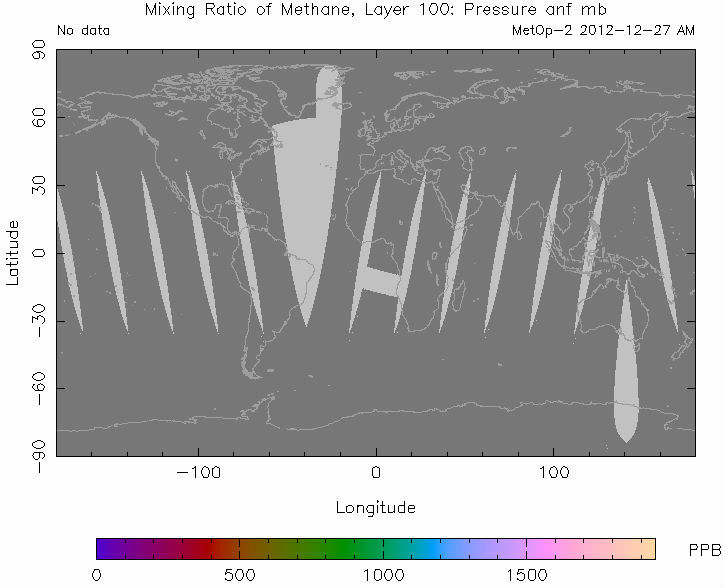 The NOAA image below shows methane levels up to 2167 ppb on December 27, 2012, for the morning set of measurements. 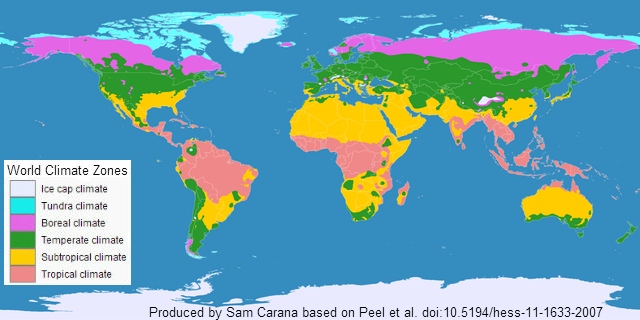 To better see where the high (yellow) levels of methane were measured, a map with empty data is added below, showing the location of the continents more clearly on the map. Pressure levels at which measurements are taken are displayed in hectopascals (symbol hPa) which are numerically equivalent to millibars (mb). A pressure of 600 mb (or hPa) corresponds with an altitude of 13794.9 ft (4204.7 m). By comparison, air pressure at mean sea level is 1013.25 hPa (millibar), or 29.92 inches of mercury. The map below, from apocalypse4realmethane2012, shows methane measurements taken on the same day (December 27, 2012, morning set), but at 718 mb, which corresponds with an altitude that is a bit closer down to sea level. The map focuses on the Arctic and shows geographic names. If you like, click on the map to enlarge it. Methane measurements were taken with the IASI (Infrared Atmospheric Sounding Interferometer) instrument, fitted onto the European Space Agencys (ESA) MetOp series of polar orbiting satellites. For further analysis, the NOAA image with surface temperature anomalies for December 28, 2012, is added above, showing anomalies up to 20 degrees Celsius. Furthermore, the NOAA image with sea surface temperature anomalies for December 27, 2012, is added below, showing anomalies up to 5 degrees Celsius. 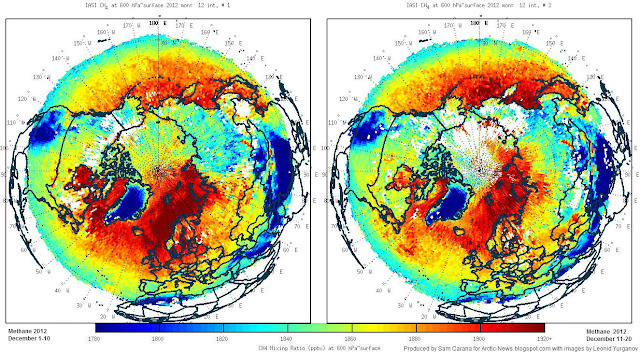 How global warming and feedbacks are causing huge albedo changes in the Arctic. Decline of the Arctic sea ice is accelerating, due to numerous feedbacks. As the Arctic atmosphere warms up, any snow cover on top of the ice will melt away ever quickly, decreasing the surface albedo and thus reinforcing the warm-up. As melt ponds appear on top of the ice, the albedo will drop even further. 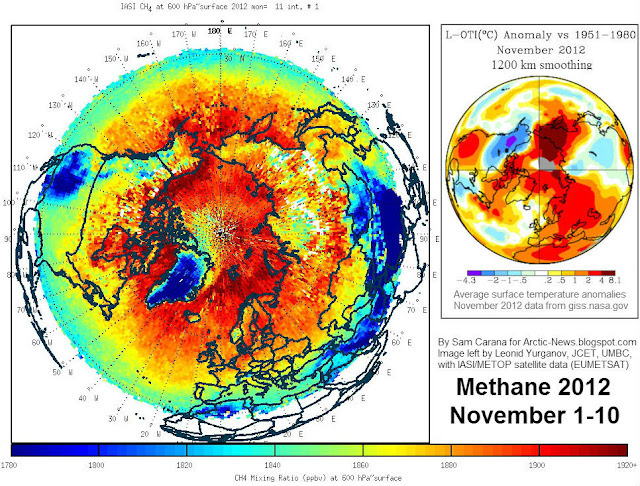 Above combination image featured earlier in the post Striking increase of methane in the Arctic. The images were produced by Dr. Leonid Yurganov, Senior Research Scientist, JCET, UMBC, who presented his findings at the AGU Fall Meeting 2012. The image below gives an update for 2012, showing an image with methane levels at 600 hPa. and for days 21-30 (below). The images show that the highest methane levels show up above the water, as opposed to above land, indicating that methane is being released from the seabed across the Arctic. Temperatures have meanwhile changed. 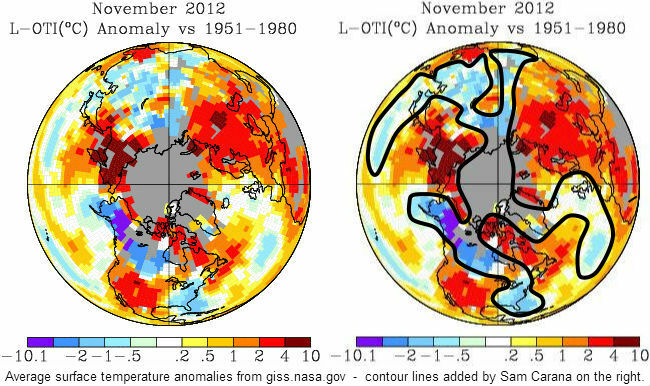 In November 2012, there were high temperature anomalies in east Siberia. There now are very low temperatures throughout Siberia, as illustrated by the Wunderground map below, which shows high temperatures. Temperatures as low as -60.5°F (-51.4°C) were recorded in Susuman, east Siberia, both on December 13th and 17th, 2012. The now hugely deformed polar jet stream and high levels of methane in the Arctic are only two out of numerous feedbacks that contribute to accelerate warming in the Arctic. Without rapid action, we can expect such wild swings in temperature to get even worse, making more extreme weather the new norm. 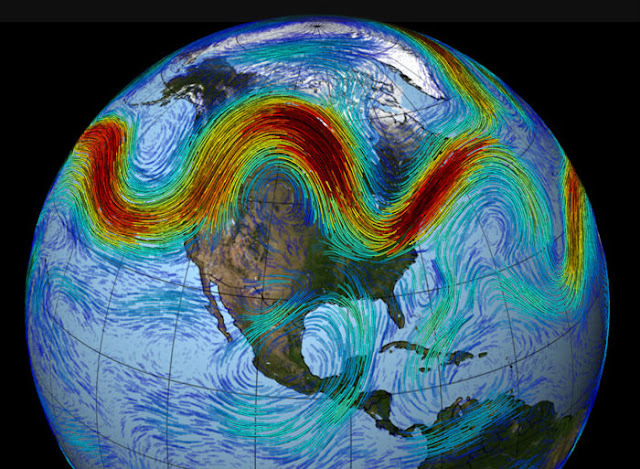 The greater the difference in temperature between north and south, the faster the jet streams spin around the globe, the polar jet stream at about 60°N and the subtropical jet stream at about 30°N, as illustrated on above image. 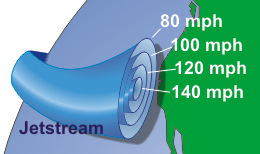 The polar jet stream used to move at speeds of up to 140 miles per hour, while following a relatively straight track that was meandering only slightly, i.e. with waves that go up and down only a little bit. Accordingly, the Northern Temperate Zone used to experience only mild differences between summer and winter weather, rather than the extreme hot or cold temperatures that we've experienced recently. Accelerated warming in the Arctic is decreasing the difference in temperature between the Arctic and the Northern Temperate Zone. This is causing the polar jet to slow down and become more wavy, i.e. with larger loops, as illustrated by the NASA image further below. This is a feedback of accelerated warming in the Arctic that reinforces itself. As the jet stream slows down and its waves become more elongated, cold air can leave the Arctic more easily and come down deep into the Northern Temperate Zone. Conversily, more warm air can at the same time move north into the Arctic. 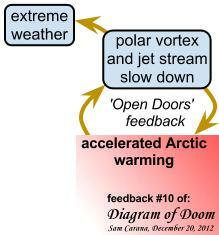 The 'open doors' feedback further decreases the difference in temperature between the Arctic and the Northern Temperate Zone, in turn further slowing down the jet stream and making it more wavy, and thus further accelerating warming in the Arctic. How does this affect temperatures? If we look at the average surface temperature anomalies for the month November 2012, we see huge differences in temperatures. Areas in the East Siberian Sea and in east Siberia registered average surface temperature anomalies for November 2012 of about 10 degrees Celsius, compared with 1951-1980. At the same time, areas in Alaska and Canada have been experiencing anomalies of about -10 degrees Celsius. This suggests a hugely deformed polar jet stream, as indicated by the contour lines on above image on the right. This is very worrying, as this is only one out of many feedbacks that come with accelerated warming in the Arctic. There are at least ten such feedbacks, as depicted in the diagram below, from the earlier post Diagram of Doom. One of the most frightening feedbacks is the albedo loss in the Arctic. The speed at which changes are taking place can be illustrated with the image below, from the earlier post Big changes in the Arctic within years. The urgency to act is perhaps best expressed by means of the two images below, which can constitute a fitting end-of-year message if you like to share them further. The image below highlights that Arctic sea ice minimum volume in 2012 was only 19.3% what it was in 1979. 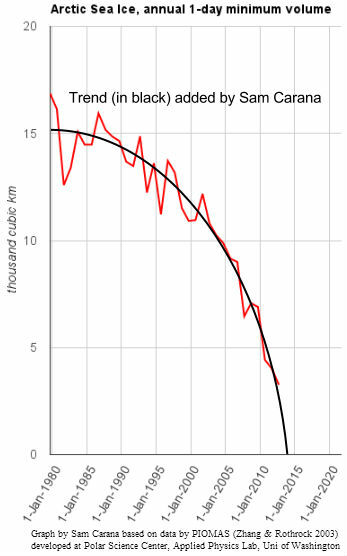 The background image, prepared by Wipneus, shows an exponential trend projecting a 2013 minimum of only 2000 cubic km of sea ice, with a margin of error that allows Arctic sea ice to disappear altogether next year, i.e. nine months from now. Finally, the image below highlights that, in 2012, Arctic sea ice area fell by 83.7% in just 168 days, again illustrating how fast things can eventuate. Paul Beckwith was recently interviewed by Ecoshock Radio, for a show that will go live to over 50 radio stations on three continents from Tuesday December 18 onward. 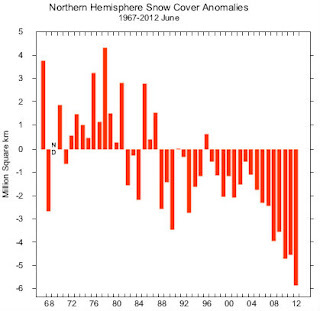 Paul speaks about Arctic albedo collapse and our "new" climate, and more. As said, the show won't air until Tuesday December 18, 2012, but an mp3 file for the earlier part of the show is already available at Radio Ecoshock. This strategic plan was prepared by the independent policy group, AMEG (the Arctic Methane Emergency Group), comprising a multidisciplinary team of leading scientific experts, system engineers, communicators and concerned citizens. The purpose of this document is firstly to warn the world of the extreme and imminent danger of global famine and ensuing strife created by rapid Arctic warming and precipitous sea ice retreat, and secondly to provide a strategic plan for handling this situation. The international community is totally unprepared for the speed of change in the Arctic, the dramatic effects on global climate and the dire repercussions on food production. The tendency among scientists and the media has been to ignore or understate the seriousness of the situation in the Arctic. AMEG is using best available evidence and best available explanations for the processes at work. 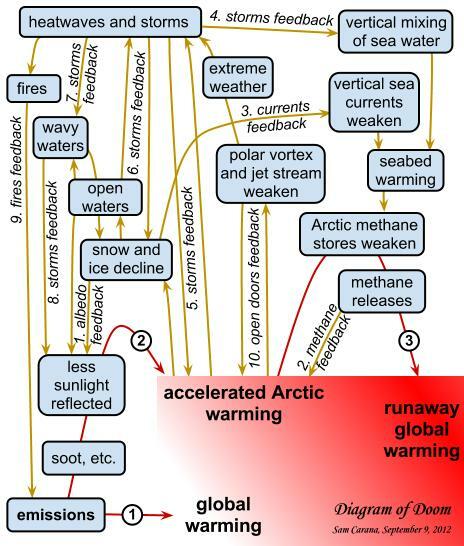 These processes include a number of vicious cycles which are growing in power exponentially, involving ocean, atmosphere, sea ice, snow, permafrost and methane. If these cycles are allowed to continue, the end result will be runaway global warming. The situation is so urgent that, unless appropriate action is taken within a few months, the window of opportunity will be lost. Adaptation to the consequences will be impossible, as famine spreads inexorably to all countries. The situation is of unprecedented danger in the history of civilisation. Humans are not psychologically prepared to deal with such mortal danger except by suppressing thoughts of it. But we, as a human society, have to “get a grip” if we are to survive. The good news is that AMEG believes that the emergency situation can be handled, but only if faced squarely and treated with focus, determination and urgency. The international community must not only tackle the effects of a growing number and severity of weather extremes, tantamount to abrupt climate change, but must also tackle the underlying cause: a vicious cycle of Arctic warming and sea ice retreat. Peoples of the world must be told the truth about the extreme danger that we all face. Then there is a unique opportunity for all nations to pull together to fight the common “enemy”, which is the vicious cycle of Arctic warming and sea ice retreat. Governments of the world must not pretend that there is no immediate crisis. They must understand the chain reaction of cause and effect, and collaborate to protect all citizens. Abrupt climate change is upon us. Extreme weather events are on the increase. Farmers are in despair. Food prices are rising. The UN climate change policy simply based on emissions reduction cannot deal with the immediate danger. The UN and member governments should have acted years ago to avert the crisis now unfolding. What has been happening in the Arctic has been completely overlooked, and now only drastic action to cool the Arctic has any chance of rescuing humanity. A key factor is the Arctic sea ice, whose reflection of sunshine keeps the planet cool. Remove the sea ice, and not only does the planet start to overheat, but the whole climate is suddenly changed. 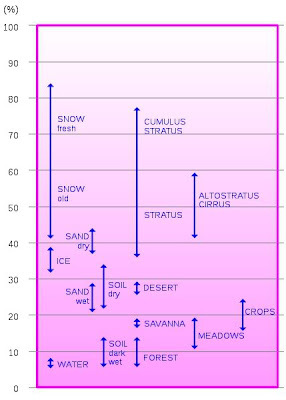 The global weather systems, on whose predictability farmers rely, are dependent for their stability on there being a temperature gradient between tropics and the poles. Remove the snow and ice at one pole, and the weather systems go awry and we have “global weirding”. Furthermore, the weather systems get stuck in one place, and we get weather extremes: long spells of hot/dry weather with drought, or long spells of cold/wet weather with floods. This global weirding has started with a vengeance. 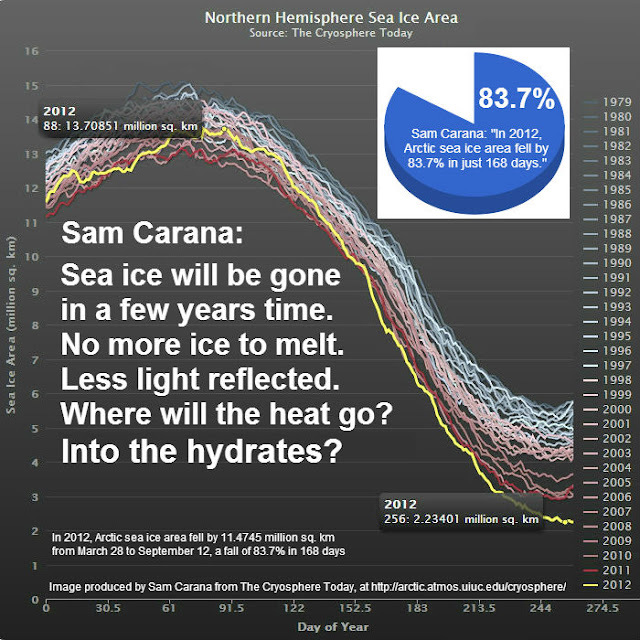 The sea ice is rapidly disappearing. The behaviour of the polar jet stream is disrupted. Extreme weather events occur more often and with greater ferocity. And the food price index climbs and climbs. There is an obvious relationship between strife and food – if you starve a nation they will fight to get food. This relationship has been pinned down by an organisation called the Complex Systems Institute, CSI. They show that the food riots break out when the food price index rises above a certain critical level. An example was the Arab Spring. Figure 1 adds trend lines to the CSI data, the Rabobank Report forecast for UN FAO Food Price Index for June 2013 and the potential repeat of 2008 and 2011 at the elevated levels resulting from the overall underlying trend of line 1. The current index is above the critical level. Because of extreme weather events this year, the index is expected to rise again in 2013. The UN’s food watchdog, the FAO (Food and Agriculture Organisation), forecast that the index will rise even further in 2014. Meanwhile the insurance industry is worried by the trend towards greater number and strength of extreme weather events, including hurricanes. Note that Sandy’s cost was greatly amplified by the diversion westward at it approached the coast off New York. Sandy had hit a jet stream blocking pattern. The loss of Arctic sea ice is leading to this kind of unusual event become more frequent. The insurers are worried, but governments should be even more worried, because extreme weather events will drive the food price index even higher. As the sea ice retreats, exposed water absorbs more sunshine, heating the water and causing further melt of the sea ice in a vicious cycle. This appears to be the dominant positive feedback loop in the Arctic, although snow retreat may contribute nearly as much to the warming of the Arctic generally in a second feedback loop. A further feedback loop is ominous: as the Arctic warms, the thawing of land and subsea permafrost allows the discharge of growing quantities of the potent greenhouse gas, methane, which in turn causes further warming in a vicious cycle. This cycle is not yet noticeable. However there is over a trillion tons of carbon stored in permafrost in the form of organic material, which is liable to decompose anaerobically to form methane. And the permafrost forms the cap on an even larger carbon store already in the form of methane. Most scientists now accept that Northern Hemisphere land permafrost will thaw entirely this century. There is the potential for the release of enough methane into the atmosphere to cause runaway global warming, with temperatures rising well over ten degrees C.
The most immediate negative impact of these cycles and the resultant rapid warming of the Arctic atmosphere is a disruption of polar jet stream from its normal behaviour, such that there are more frequent and more severe weather extremes experienced in the Northern Hemisphere. This impact has grown so conspicuously over the past few years that we can honestly say that we are now experiencing abrupt climate change. The result of this climate change is widespread crop failure and an ever deepening food crisis. A measure of the worsening situation is the food price index. This has spikes when the price of oil rises, but the underlying value has been rising steadily since 2006. Today, the index is slightly more than the critical price level above which food riots are liable to break out – an example having been the Arab Spring. Largely as a result of the crop failures this year, the FAO forecast that the index will rise higher in 2013 and higher again in 2014. If the trend in weather extremes continues, then these figures could prove optimistic. With a billion people on the edge of starvation today, we could see 2 billion by this time next year. It will be a humanitarian disaster. Furthermore, social unrest will rise, and economic growth and stability compromised in the developed and developing countries. 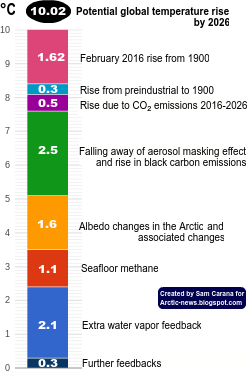 However there are longer term impacts and threats of Arctic warming, in particular (i) Greenland Ice Sheet destabilisation, (ii) accelerated methane discharge, (iii) loss of biodiversity and habitat, and (iv) heat absorption making it more difficult to keep to global warming targets. As the snow and sea ice retreat from their levels in the 70s, more solar energy is absorbed. Taking the 70s as the baseline (zero forcing), this year's retreat produced as much as 0.4 petawatts of climate forcing averaged over the year. Much of this heat energy is retained in the Arctic, causing ice to melt and sea and land temperatures to rise. As temperatures rise, there will be slightly more thermal radiation into space, dissipating some of this energy. However most of this heat energy will slowly dissipate across the planet - and 0.4 petawatts is equivalent to half the forcing producing by anthropogenic CO2 emissions (1.6 watts per square metre). Peter Wadhams has estimated that the sea ice retreat by itself is equivalent to the forcing from 20 years of CO2 emissions, thus making it much more difficult for the global temperature to be kept below the so-called safe limit of 2 degrees warming. However these long term effects are somewhat academic, if the immediate impact is to raise food prices far above a safe level. It is much easier to think about and quantify the longer term impacts of Arctic warming than the more immediate impacts. This is a trap for the unwary. Therefore AMEG is trying to bring the world's attention to the immediate impacts, as they turn out to be colossal even this year, and are likely to be worse in 2013 and even worse than that in 2014. It is clear that abrupt climate change has started, but not in the way we had been told to expect. Yes, there would be more climate extremes as the planet heated, but we were expecting a linear or near linear behaviour of the climate system, with gradual temperature change over the century. Instead we have striking non-linearity, with exponential growth in frequency and severity of climate extremes. 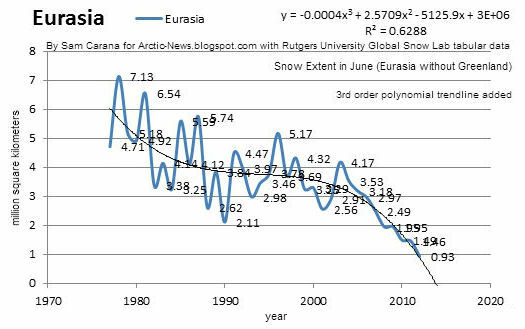 This non-linearity is almost certain to have arisen from the exponential decline in sea ice, as shown in the PIOMAS sea ice volume trend. The trend is for September ice to fall to zero by 2015. Thus we can expect one month without sea ice in 2015, with the possibility for this event in 2014 or even in 2013. Apart from volcanic eruptions and earthquakes with their step changes of state, the behaviour of the sea ice is possibly the most non-linear part of the Earth System because the melting is a threshold process. Until recently it was not well understood how the retreat of sea ice could cause a commensurate increase in weather extremes. But now it has become clear. 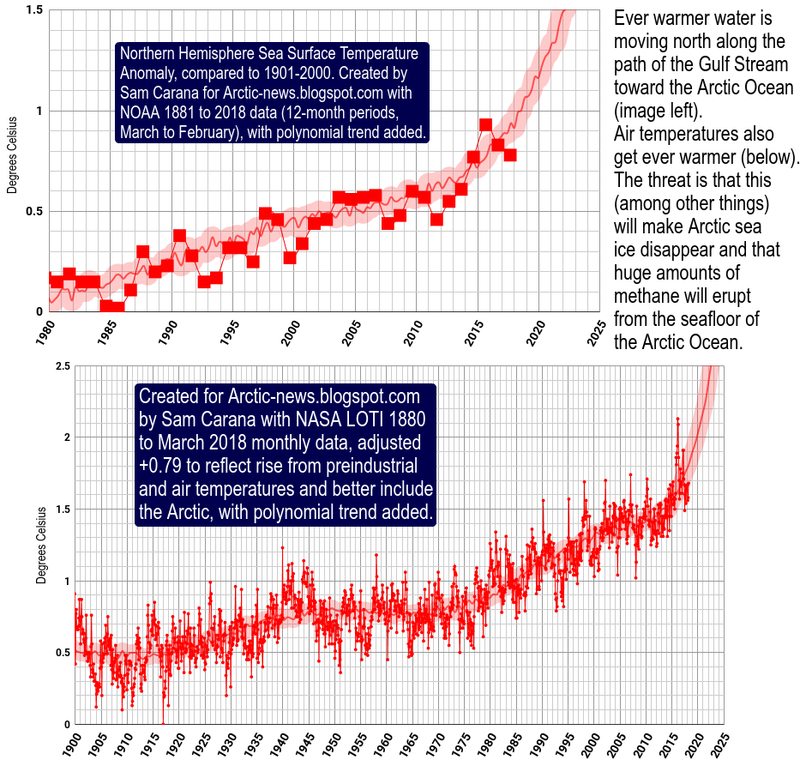 The retreat of sea ice is causing a non-linear rise in Arctic temperature, so that it is now rising at about 1 degree per decade, which is about 6x faster than global warming, reckoned to be rising at between 0.16 and 0.17 degree per decade. The temperature gradient between the tropics and the Arctic has reduced significantly over the past decade, as a result of this so-called ‘Arctic amplification of global warming’. It now appears that the polar jet stream behaviour is critically dependent on this gradient. As the gradient diminishes, the jet stream meanders more, with greater amplitude of the Rossby waves and therefore with peaks further north and troughs further south. This effect alone produces weather extremes - hot weather further north than normal and cold weather further south than normal. But as well as meandering more, the jet stream is also tending to get stuck in so-called 'blocking patterns', where, instead of moving gradually eastwards, the jet stream wave peak or wave trough stays in much the same place for months. This blocking may be due to stationary highs over land mass and lows over ocean, with the jet stream weaving round them. Here we may be a witnessing of a dynamic interaction between the effects of Arctic amplification and global warming. Note that there was a similar dynamic interaction in the case of Sandy. Ocean surface warmed by global warming lent strength to the hurricane and provided a northerly storm track up the coast; and then a sharp left turn over New York was prompted by meeting a jet stream blocking pattern. As a climate scientist, one might have expected a reduced gradient between tropics and pole to have some effect on weather systems, because there is less energy to drive them. 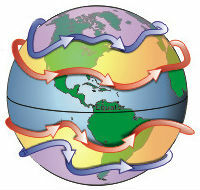 The normal pattern comprises 3 bands of weather systems around the planet for each hemisphere, with each band having 'cells' of circulating air. The air rises at the tropics, falls at the next boundary, rises at the next, and falls at the pole. There has to be an odd number of bands, so that there is air rising at the equator and falling at the poles. 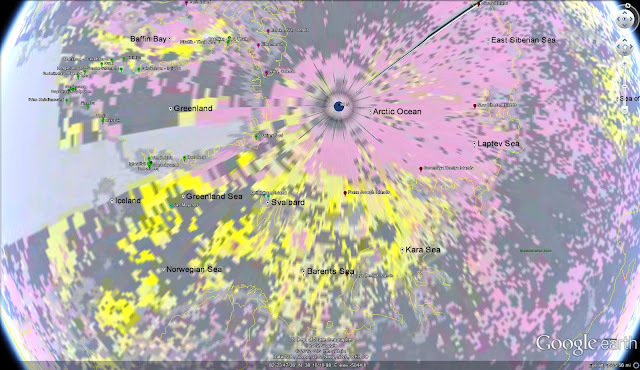 The jet streams are at the boundary between the bands. As the temperature gradient between tropics and pole reduces, one would expect the weather systems to spread in a chaotic manner, meandering more wildly. This is exactly what has been observed. The sticking of the jet stream must be associated with non-uniformities of surface topology and heat distribution. Thus highs and/or lows are getting stuck over some feature or other, while the jet stream meanders around them. Thus there is a reasonable explanation for how we are getting weather extremes, simply as a result of a reduced temperature gradient between Arctic and tropics. Another argument that has been given, most notably by Professor Hansen, is that the extreme weather events are simply a result of global warming - i.e. a general rise in temperature over the whole surface of the planet. Global warming can indeed explain a gradual increase in the average intensity of storms (whose energy is derived from sea surface warming) and in the peaks of temperature for heat waves. But global warming does not explain the observed meandering of the jet stream and associated weather extremes, both hot/dry and cold/wet, whereas the warming of the Arctic can explain these observations. Furthermore the non-linear warming of the Arctic can explain the non-linear increase of extreme events. Since this hypothesis seems reasonable, it is fitting that the precautionary principle should be applied when it comes to trends. The forecasting of extreme events must take into account the trend towards more extreme events as the Arctic warms. And the Arctic is liable to be warm about twice as fast in 2015 as it in 2012, because of sea ice retreat. This all adds up to a picture of abrupt climate change in the Arctic, now spreading to the Northern Hemisphere and soon to afflict the whole planet. These changes must be halted and then reversed. Meanwhile the effect on food security must be handled before the whole situation gets much worse. What should a country do, when faced by such a grave food crisis? The immediate response may be to become introspective and try and insulate the country from what is happening in the rest of the world. For a country like the UK, this is difficult, because of importing 40% of food and much of its energy requirements, such as natural gas from Kuwait. For the US, self-sufficiency has been a goal for energy, but there is a food problem from weather extremes, which particularly seem to affect the country. For countries which have been net exporters of basic foodstuffs, the response may be to halt exports, as Russia did for wheat recently to protect its citizens but pushing up the food price index in the process. If this type of response is widespread, then a vicious cycle of food price increase and protectionism could develop, with a stifling of world trade and an increase in strife between countries. But what people must not do is to ignore the non-linear trends and blame the weather extremes either on random fluctuations or on essentially linear effects such as global warming. The danger is that governments will do nothing at all to address the underlying cause of the linearity, which lies in the vicious cycle of Arctic warming and sea ice retreat. We believe that a sensible strategy is two-fold: to deal with the symptoms of the disease and the cause of the disease. The most conspicuous symptoms are floods, droughts, food price increase, security of food supply and food shortages. Less conspicuous are the effects of food price increase on global unrest and the spread of disease among humans, animals and plants. Water shortages may also be a growing issue in many countries. The changing frequency, severity, path and predictability of tropical storms (hurricanes, typhoons, monsoons, etc) will be a major issue for many countries, especially those with large coastal conurbations and those who depend on regular monsoons. Coastal regions and cities that have hitherto been immune to such storms may suffer great damage, as happened with Sandy to New York and could happen to Dubai. Countries which rely heavily on one crop for income are liable to be heavily hit by weather changes. By studying trends, one can estimate how quickly the situation is likely to deteriorate. One can see an exponential rise in extreme weather events, and the food price index is liable to follow this trend because of reduced agricultural productivity. The price of food is dependent on a number of factors besides agricultural productivity, and these are under human control. The policy of “food for fuel” has undoubtedly driven up the price of food, so this policy needs to be changed. Biofuel can still be part of policy, but must come from sustainable sources and without competing with food. For example biofuel from the biochar process can actually benefit food production, because the residue from heating biomass and producing the biofuel is a form of charcoal that can be used for improving soils, water retention, and crop yields. An important factor in the price of food is the price of oil, because of use of oil in agriculture, not only for farm machinery and food transport but also for artificial fertiliser. Unfortunately much oil comes from countries where much of the population is on the bread line, so the social unrest from food price increase can shut down access to the oil which further pushes up the cost of food in a vicious cycle. Speculation on the price of oil can be a major factor in producing spikes in the food price index, so this needs to be discouraged in some way. Similarly speculation on food commodities needs to be discouraged. Perhaps the most important factor is management of food stocks, seed stocks, planting practice (use of monoculture, GM crops, etc. 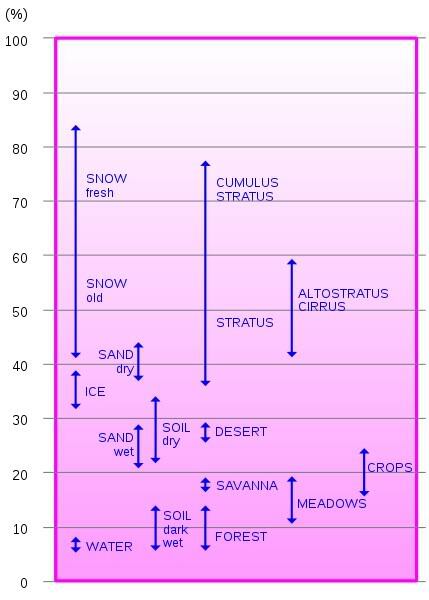 ), timing of planting and irrigation. The timing becomes increasingly problematic as global weirding increases and weather becomes more unpredictable. There needs to be advice to farmers on how to cope – e.g. by judicious diversification and reduced reliance on single crop planting. Dealing with the underlying cause of the climate extremes turns out to be even more important than dealing with the consequences on food security, because the underlying cause is a process which is gaining momentum and could become unstoppable in 2013. In effect, we are approaching a point of no return, after which it will be impossible to rescue the situation. The speed of action is required because of the speed of sea ice retreat. All indications are that there will be a major collapse of sea ice next year, with a new record minimum. And September 2015 is likely to be virtually sea ice free. 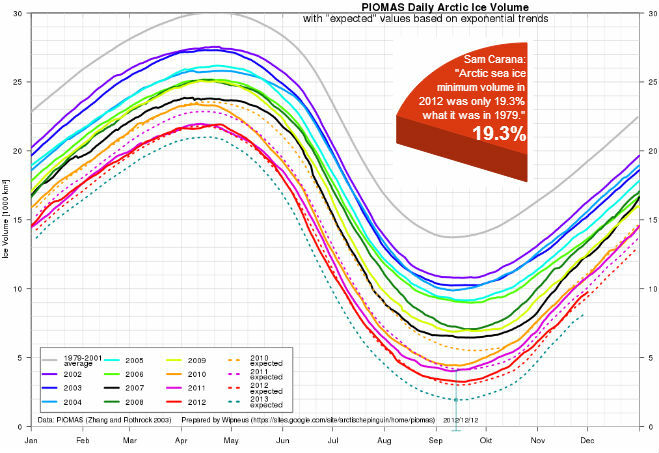 This is the inescapable evidence from the PIOMAS sea ice volume data. Even if there were no danger from passing a point of no return, rapid action would be worthwhile because of the financial and human cost of the abrupt climate change. The only chance of halting this abrupt climate change in its tracks is to cool the Arctic, and prevent Arctic amplification disrupting the jet stream more than it is at the moment. Delay to such action would cost around a trillion dollars per year and put a billion people into starvation. The target should be to prevent a new record low of sea ice extent next year (2013). This involves providing sufficient cooling power into the Arctic to offset the warming which has built up as the sea ice has retreated. 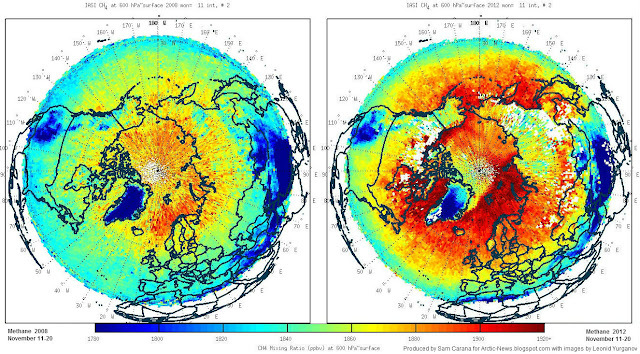 This warming is due to the “albedo flip effect” and is estimated as being up to 0.4 petawatts averaged over the year. This warming has to be countered by an equal cooling power, if the target is to be met. This is a colossal engineering and logistics challenge. A war effort on developing, testing and deploying geoengineering techniques would be justified to meet the target. Clouds have effects in opposite directions: reflecting sunshine back into space and reflecting thermal radiation back to Earth. The former cools, the latter heats. Geoengineering tries to enhance the former and/or diminish the latter, to alter the balance towards cooling. The balance is critically dependent on the droplet size: there is an optimum size for reflecting sunlight, as for the particles to make white paint. Particles much larger than this will reflect thermal radiation strongly. When the sun is high in the sky, the balance is towards cooling by reflection of sunlight; but when the sun is low in the sky, the balance is towards heating by reflection of thermal radiation. Thus techniques for cloud brightening tend not to work well in winter at high latitudes. Clouds also can produce snow which will generally increase albedo to around 0.85 where it falls; whereas rain will generally reduce albedo by melting any snow and by forming puddles or pools on land or ice surfaces. However, rain or snow falling through a dusty atmosphere can darken the surface on which it falls. Hence the black carbon from tundra fires may have some sunshine reflecting effect while in the atmosphere, but then reduce albedo when it’s washed out. There are a number of different things to do with clouds: create them (typically as a haze), brighten them, extend their life, reduce them by precipitation (rain or snow), or reduce them by evaporation. By judicial choice of quantity, altitude and latitude for injection of aerosols, one can obtain a much longer cooling effect in the stratosphere than in the troposphere. Thus one needs much less aerosol in the stratosphere to produce the equivalent effect in the troposphere. Note that the eruption of Mount Pinatubo in 1991 produced a global cooling of 0.5 degrees C over a period of two years. Providing cloud condensation nuclei (CNN) of the right size can brighten clouds without significantly affecting their lifetime. Sulphate aerosol in the troposphere produce both a reflective haze and CNN. These combined effects from aerosol ‘pollution’ have masked global warming by as much as 75%. If all coal-fired power stations were shut down, there would be a significant decrease in aerosol cooling and an upward leap in the rate of global warming. cloud removal to allow thermal radiation into space. The first technique mimics the action of large volcanoes such as Mt Pinatubo which erupted in 1991 and had a cooling effect of 0.5 degrees C over 2 years due to the sulphate aerosols it produced in the stratosphere. However larger particles in the aerosol are liable to reflect thermal radiation from the planet surface, hence having a warming effect. To avoid this, there is an advantage in using TiO2 particles, as used in white paint. These can be engineered to a constant size, and coated to produce required properties, such as not sticking to one another. Large quantities could be dispersed at high latitudes in the lower stratosphere either using stratotankers or balloons, to have an effect lasting a few months during spring, summer and early autumn. Due to circulating winds, the aerosol will spread around the latitude where it has been injected. Cloud brightening is a technique whereby a very fine salt spray is produced from special spray nozzles mounted on a ship, and gets wafted up to clouds where it increases their reflective power. Whereas stratospheric particles can provide blanket cooling at particular latitudes, the brightening technique can be used to cool particular locations, using sophisticated modelling to decide when and where is best to do the spraying. The third cooling techniques involves removing certain high clouds during the months of little or no sunshine when they are having a net blanketing effect – reflecting heat back to the ground. Additional techniques should be considered for more local cooling, especially by increasing surface albedo; for example one could increase snowfall over land or brighten water by injection of tiny bubbles. Another technique is to break up the sea ice in autumn and winter, which has the effect of thickening the ice and producing what looks like multi-year ice. A very promising approach is to reduce currents carrying water into the Arctic Ocean, in particular the partial damming of the Bering Strait. 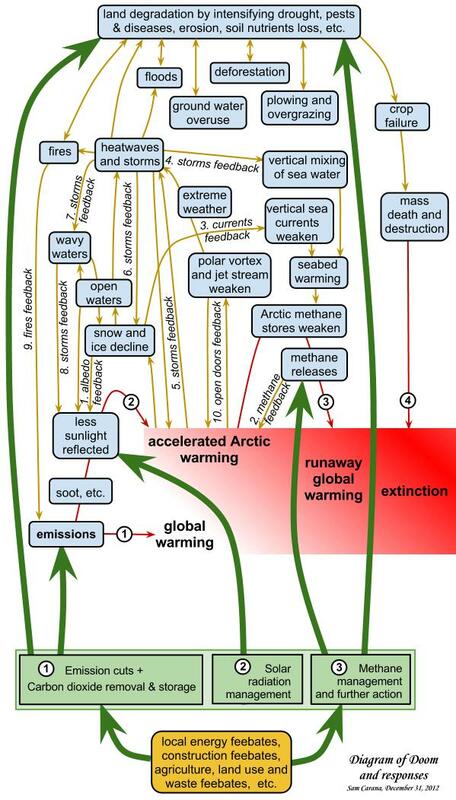 Note that all the above techniques are expected to enhance the Arctic ecosystem, which is in danger of sharp decline as a result of sea ice collapse. add a layer of white granules or reflecting sheet. Much attention should be given to short-lived climate forcing agents, such as methane. There should be a moratorium on drilling in the Arctic, as proposed by the UK Environment Audit Committee in their report “Protecting the Arctic”, September 2012. Measures to reduce black carbon should be taken. There should be teams of fire-fighters set up to take prompt action on tundra fires, which produce black carbon, methane and carbon monoxide – all undesirable. Cloud brightening and wave pump technology can be used to cool the surface of the sea in specific areas. This technology holds promise to reduce the power of hurricanes and other storms, but might also be used to produce precipitation where needed or dampen oscillations of the planet’s climate system, e.g. ENSO (El Nino Southern Oscillation). AMEG realises that there is a problem of growing methane emissions from the high latitude wetlands and from permafrost which is thawing, both on land and under the sea bed. Methane is a potent greenhouse gas, so we have been investigating how to suppress methane and methane production. We have some valuable ideas, based on use of diatoms in water treatment. The water treatment means that fish can thrive where previously the water was brackish. Thus, not only is methane suppressed, but fish farming becomes possible on a very large scale at very low cost. Increasing food production is going to become paramount in a warming world with a growing population. Essential to all geoengineering deployment is good modelling of the climate system. Unfortunately, none of the global climate models deal with the speed of events in the Arctic. It is essential to have a good understanding of the processes at work. Part of the war effort to meet the geoengineering target must be devoted to improving the models. Similarly there must be adequate monitoring facilities to ascertain the effects of geoengineering, and prevent inadvertent negative impacts. Some satellites which could supply appropriate monitoring are nearing the end of life or coming out of service, so must be replaced as quickly as possible. Cooling the Arctic is not the only step that is required to save civilisation from fatal consequences of mankind’s interference with the Earth System, but it is prerequisite. Assuming the sea ice is restored, global temperatures could still rise too high, oceans acidify too much or rainforests dry out and burn down. AMEG supports efforts to deal with such matters. But cooling the Arctic is the first emergency response strategy. This is in two parts: firstly interventions for adjustment/restoration/repair of critical Earth System components, especially in the Arctic; and secondly the food crisis, especially the politics of dealing with the situation such to avoid vicious cycles that could jeopardise stability of food production or lead to panic among peoples. Something akin to a war room needs to be set up, bring experts from all the relevant fields, in order to brainstorm on the problems and possible ways forward. These interventions can be viewed as adjustments, restoration and repair of critical Earth System components. Examples include cooling the Arctic, restoring the sea ice and returning polar jet stream behaviour to a more acceptable mode. For each intervention there may need to be modelling to predict effects and effectiveness and to anticipate problems arising. Correspondingly there needs to be observations, monitoring and measuring of results. The observation of process and the measurement data obtained should be fed back into the models to improve them. Establish the positive and negative net forcing from contrails, and encourage flight paths of commercial airplanes to reduce positive or increase negative net forcing. The ban on polar flights, lifted recently, should be reintroduced. Prepare the supply and logistics for spraying aerosol precursor in large quantities, preferably into the lower stratosphere, for deployment by next March or April (not sooner because the risk of ozone depletion). Of course, possible negative impacts have to be considered before large scale deployment, but it is worth being fully prepared for such deployment on the assumption that this technique can be made to work effectively. Develop and test the deployment of suitably reflective particles, of such materials as TiO2, as alternative or supplement to sulphate aerosol. Prepare for large scale deployment. Finance the development of, and deployment capability for, marine cloud brightening, with a view to deployment on a large scale in spring 2013 - assuming that is the earliest conceivable time. The main technical problem seems to be with the jets, so experts from major companies in the ink-jet technology field need to be brought in. Boats and land installations need to be kitted out. Finance the development and deployment capability for cirrus cloud removal, since this is a promising technique. Suitable chemicals need to be identified/confirmed, with stock-piling of these cloud seeding chemicals. Aircraft need to be kitted out to spray these chemicals. Finance brainstorming sessions for geoengineering, with top scientists and engineers, such as to suggest further measures, improvements to above techniques and the development of other intervention ideas. Finance the research and trials of all promising techniques for helping to cool the Arctic, including the three geoengineering techniques above. Update Earth System models to deal with the actualities of sea ice retreat, such that the effects of different techniques can be modelled and optimum joint deployment strategies established. Finance the research and trials of promising techniques for dealing with methane, especially the reduction of methane from wetlands draining into the Arctic. Use of diatoms to promote methanotrophs (and healthy conditions for fish) is one such technique. Finance the research and trials of promising techniques for dealing with surface melt of the Greenland Ice Sheet (GIS) and for reducing the speed of ice mass discharge. The latter is accelerated by warm water at the sea termination of glaciers; therefore consideration should be given to techniques to cool this water. Consider techniques for reducing Arctic storms and their strength. Techniques should be developed for reducing the frequency and severity of tropical storms, such as to minimise damage, especially to agriculture and low-lying conurbations. Consider techniques for un-sticking of blocked weather patterns. Consider techniques for improving surface albedo of sea, lakes, snow and ice by brightening water with bubbles, covering snow and ice with white granules or sheets to prolong albedo, draining pools on ice, forming ice on pools, depositing snow on ice (as fresh snow has a higher albedo) and on land, discouraging growth of plants with low albedo, etc. Note that a new idea for improving surface albedo has been suggested in a paper to the AGU 2012, supported by AMEG founder member, Peter Wadhams.. His research on iceberg calving has led to ideas for reducing discharge of ice from the GIS. A word of warning about finance of research, development and field trials: it is important that the results of such activities are independent, unbiased and free from financial interest. Following the launch of AMEG’s ‘Strategic Plan’ the above actions will be communicated to all world leaders and relevant parties in the form of an ‘Essential Action Plan’ to match the pending circumstances of the change in the world’s weather patterns.